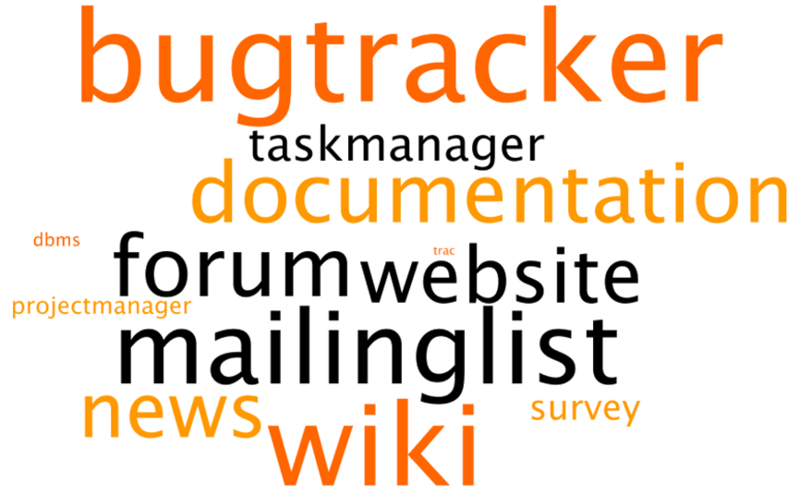 BTRbugtracker (BTR): Forge offers bug-tracking system. DBMdbms(DBM): Forge provides database management system for teams. DOCdocumentation (DOC): Forge offers a designated spot for documentation. FORforum (FOR): Forge offers software so that project teams can host forums. MALmailinglist (MAL): Forge offers software so that the project teams can host mailing lists. NEWnews (NEW): Forge offers a news or announcement service to teams to publicize their activities. PRMprojectmanager (PRM): Forge offers various project management software. SURsurvey (SUR): Forge offers survey software to project teams. TKMtaskmanager (TKM): Forge offers various task management software. TRAtrac (TRA): Forge offers Trac software to project teams. WEBwebsite (WEB): Forge offers website space to project teams. WIKwiki (WIK): Forge offers wiki software to project teams. 1. Alioth: survey examples I found seem to require login. Survey data appears unavailable to non-authenticated users. 2. Codehaus: Calculated number of projects on CodeHaus by using the project directory to list projects alphabetically, then summing the counts (total 288). Codehaus does not have a project directory so it was somewhat difficult to survey a variety of projects. Uses Jira for bug tracking and Atlassian for documentation. 3. FedoraHosted: only provides trac, so very difficult to find project-level metadata in unstructured text. 4. Gna: French Free Software Foundation site. 5. Google Code: Does have a project search and directory, but too large to use to calculate manually the number of hosted projects. 6. Java.Net: Merged with Project Kenai. 7. JavaForge: Projects can choose which items to make available. Here I have coded "yes" for any features that I saw in a consistent location on a subset of project pages, but these widgets (for example tracker details) are located on different screens for different projects. 8. Launchpad: Mailing lists are associated with teams, not projects. So find a team first, then find the mailing list archives, if any. 9. Objectweb: Has a middleware focus. Wiki is available on a centralized OW2 wiki server. Edits and history are for logged-in users only. News and news archive is available but no RSS for that. Survey data appears unavailable to non-authenticated users. 10. Origo: does not have a directory, so I used the "recent projects" featured on home page to check out what projects were hosted there. Origo has a bugtracker but the history would have to be gleaned by searching for and then combining 'open' and 'closed' I think. Documentation is done via the wiki system. 11. OSOR.eu: Forge includes federated sites hosted elsewhere, but I did not include these in my project counts. 12. Rubyforge: Survey data appears unavailable to non-authenticated users. 13. Sarovar: Sarovar is based in India. Survey data appears unavailable to non-authenticated users. 14. Sharesource: Offers a project page but not a full-featured web site with ability to run scripts, etc. 15. Sourceforge: Sourceforge has a feature request manager which I have coded as 'Task Manager'. 16. Tigris: Calculated number of projects from project directory (by categories). There may be duplicates if projects are listed in more than one category. Mailing lists are now called discussions, so I've coded these as 'forums'. 17. Tuxfamily: Offers PostgreSQL in addition to MySQL but was the only forge to do so, so I did not create a separate tag for this.